Since then, this picture and the passion flower has become a quiet symbol for me, of sending out the best- in the worst possible scenario- ALL of our energy & gifts. And of our true, in-born tenacity. 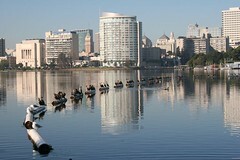 When I first moved to Oakland, April 2002, I worked in the heart of downtown. I treasured my 45min walk to work in the mornings; the gorgeous cool air, Lake Merritt, flocks of coastal birds diving the skyline. This wasn’t my first urban experience, but it was definitely the rawest. Once in town, walking up Broadway, I’d pass storefronts, the famous Paramount Theater, the row of pot club coffee shops with their cat calling bouncers (the area was later dubbed Oaksterdam), then past the coffee shops that actually served coffee, the halfway houses, the men on their way to State & Federal parole appointments. It was all fascinating to me; how just walking by, you’d get solicited for everything- just walking to work! Crazy. By 5pm, downtown changed completely- with a whole new cast and crew that took to the streets. But how I loved Oakland’s edge; it was intense & exciting. One day walking- all in my head with the tasks of the day- a swirl of color caught my eye. I looked to see the most amazing flower! It was mystical, otherworldly; it was like some mother ship from a fantastical galaxy. It was so hardy with its perfectly ordered, multi-colored exotic layers, that it looked plastic. I had to touch it. It was dense and hardy indeed. The flower and dozens of big buds hung from a thick, vine-of-a-bush whose tendrils wrapped tight through 4 feet of chain link fence. The whole plant with it’s color wheel and perfection was the most unlikely presence in this urban grit-scape; it’s small trunk squeezed through a 1-inch crack between parking lot and sidewalk. It became my little miracle creature. I savored it every Spring and would clandestinely dump water at it’s base in the dryest Summers. Over the years, the fence began to lean, until one day, the whole thing lay flat on the asphalt. But the tenacious plant hung on; it stayed that way, blooming boldly horizontal for at least another two years before someone removed it; fence, vine and all. Since then, this picture and the passion flower (or passion vine) has become a quiet symbol for me. One of sending out the best- in the worst possible scenario- ALL of our energy & gifts. And of our true, in-born tenacity. I forget this sometimes. I send this picture to anyone who is going through a hard time. We forget that we are naturally this strong. I love it when Nature reminds me. The only part of Oakland I’ve ever been in is the airport, on the way to Korea! This is really interesting because I also blogged about this same flower here:http://secondsurf.blogspot.com/2010/08/great-love.html ! 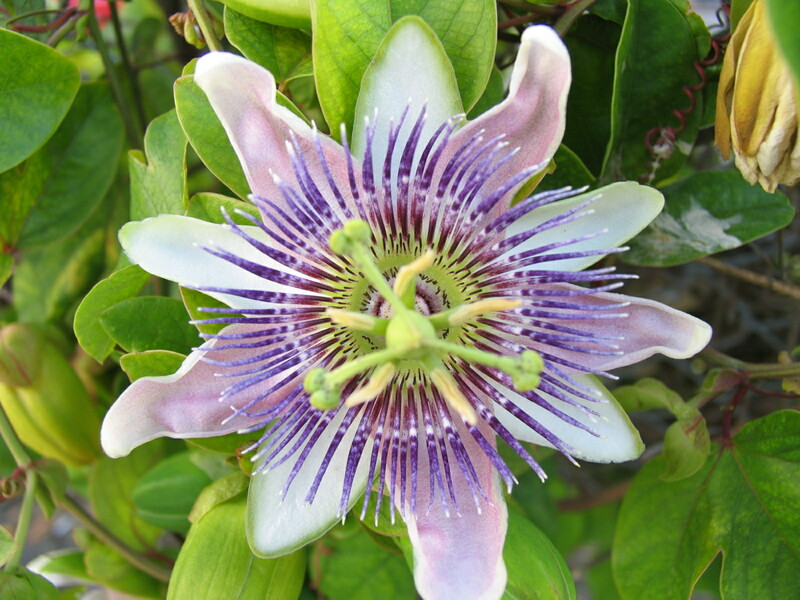 I didn’t know it was called a passion flower…the universe works in mysterious ways. I can’t wait to take a listen to your music! crazy. It looks like it was growing wild where you found it? I’ve since seen it in several colors. I am soo excited to get your beautiful Art beads. Can’t wait. Thank you!